Follow the base recipe to make the macarons. Add yellow concentrated food coloring to the mixture, while beating the egg whites. 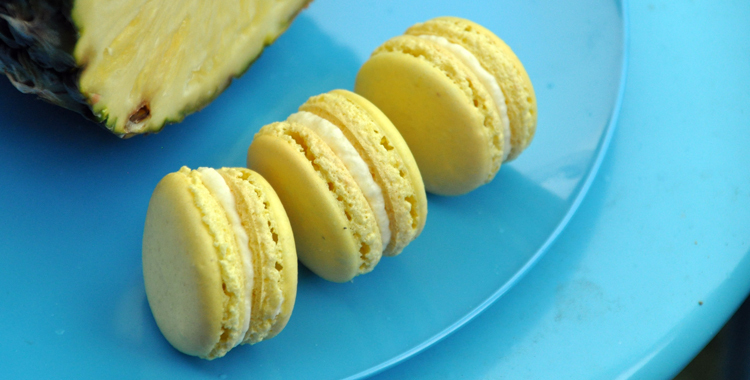 Bake and cool the macarons.Soak the gelatin sheets in cold water, while using a blender or a good hand blender to puree the pineapple. Heat up two tablespoons of water, and melt the gelatin in the water. Pour the gelatin in the puree while stirring. Cool completely. Turn the heavy cream and sugar into whipped cream, and mix the pineapple puree gently into it. When the cream has thickened a bit (after some time in the fridge), you can start sandwich the macarons. Use a teaspoon, a knife or a piping bag, whichever you prefer: turn a macaron upside down, add 1/2-1 teaspoon of the filling, and press the bottom of another macaron on top of it.